So you've decided to start reading a new webcomic. Well, not a new webcomic, one that's been around for a few years. Maybe you just need to read a couple hundred pages in order to get caught up, but maybe you're just getting started on Sinfest (4300+ pages), Schlock Mercenary (4400+ pages) or Kevin and Kell (5600+ pages). How do you dive into the archives without drowning? For years, I've kept afloat by bookmarking tons of webcomics (and then forgetting about the bookmarks), keeping the tabs for comics I'm reading perpetually open (and then losing my place when my browser crashes) and rooting through the archives to figure out where I left off (and occasionally throwing my arms up in defeat). It's a minor miracle that I ever complete an archive binge. A few months ago, I decided to try out a new service, Comic Rocket. Comic Rocket has indexed more than 9,000 webcomics so that it can keep track of your place as you read the comic. It looked simple. It looked easy. Could it save me from my disorganized webcomic reading?Comic Rocket is, in fact, very simple to use. Just sign up for an account, type in the name of the webcomic you want to start reading and see if Comic Rocket has indexed it. If it has, you can click "Add to My Comics" and start reading. You'll see the normal website for the webcomic, but with a Comic Rocket toolbar on top demarcating your reading progress. Instead of using the webcomic's "Next" and "Back" buttons to read, use the arrow keys on the toolbar. That way, Comic Rocket knows how far you've read. Finally, I can close my tabs without fear of losing my place, and come back to Comic Rocket and pick up right where I left off. Occasionally, I do run across a webcomic I want to read that isn't indexed by Comic Rocket, but I'm pleasantly surprised by how rarely that happens. Personally, once I've gotten up to date on a webcomic, I move it right into my RSS reader, but if you don't prefer that particular sort of digital IV drip, you can use Comic Rocket to keep up with the webcomics you're currently reading. 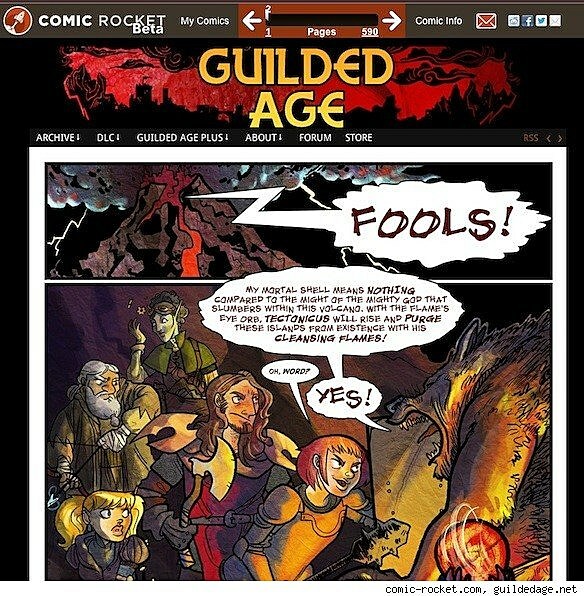 Once a comic is updated, Comic Rocket shows the updated pages in your queue. Handy. Really, my only gripe with Comic Rocket is that it doesn't work as well on my iPad browser as on my laptop. On the laptop, the toolbar stays locked at the top of the browser, ready for you to click the "Next" arrow when you read the bottom of the page. With the iPad's Safari browser, I keep having to scroll back up to the top of the page when I want to hit "Next." I'm crossing my fingers that Comic Rocket will eventually be available as an app, so it can track my comics within its own browser. So has Comic Rocket made my webcomic reading smoother and easier? It has. It's nice to have everything I'm catching up on stored in one place, with a counter to see how far along I am. It's handy being able to read a few dozen pages at a go and then pick the webcomic up again a few days later. I've even managed to discover a few webcomics through Comic Rocket that I'm not sure I would have otherwise. In addition to recommending webcomics based on your saved comics, Comic Rocket has comics handily organized by genre, letting me feed my sci-fi webcomic habit. If you've been hesitant about jumping on that 10-year-old webcomic because of its bulging archive, I'd certainly recommend signing up for Comic Rocket and giving it a shot. Even if you give up after 100 pages or so, Comic Rocket will hold your place for whenever you decide to pick it up again.